Nelsa Guambe is a self-taught artist who lives and works in Maputo, Mozambique. 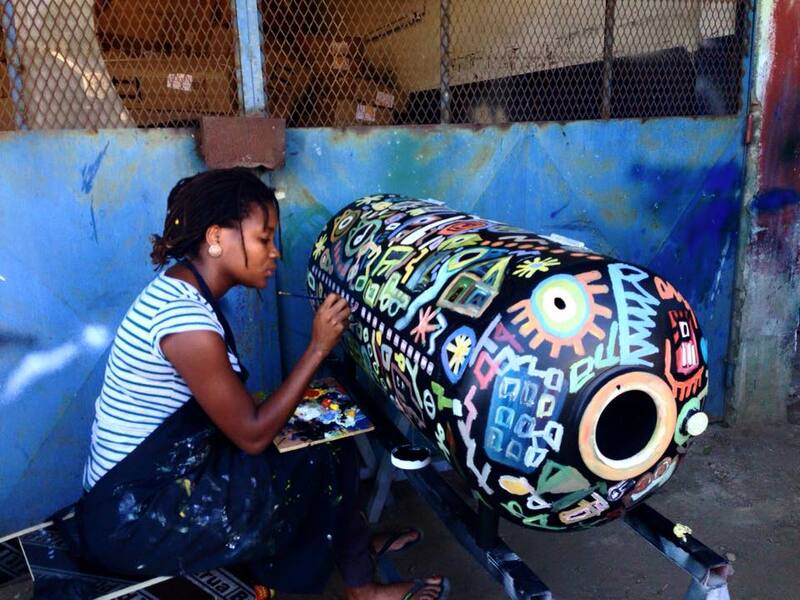 She is primarily a painter whose work moves beyond the canvas to incorporate product design, where working in collaboration with a local design studio, Piratas Do Pau Guambe’s colourful and surreal images help to transform discarded water heaters collected from the city’s streets into distinctive functional products such as wine racks and lighting. Guambe’s work is part of the IFA Pure Gold exhibition, a traveling exhibition which explores rubbish and its use in sustainable design to creating objects of value in design. NELSA TELL US A BIT ABOUT YOUR BACKGROUND? WHAT INSPIRED YOU TO BECOME AN ARTIST, WHEN YOU STARTED YOUR PRACTICE, AND YOUR ARTISTIC JOURNEY SO FAR? My background is in development work. I have a bachelor degree in public administration and development studies from UNISA (University of South Africa). I worked for the German Development Corporation for 4 years in disaster risk management and climate change adaption. I liked my job very much, but somehow I always wanted to become an artist, the idea of making things by hand always fascinated me. During my work at GIZ, I used to paint in my free time and participated in different exhibitions. At the end of 2014 everything changed, I quit my job and decided to take this adventure of becoming a full-time artist, which was not well received by my parents; the idea of me leaving a stable job for the unknown worried them. At the beginning, I wasn’t sure where to focus on, as my interest has been more towards photography. It just happened that I found myself painting every day, and in 2015 I organized 2 solo exhibitions here in Maputo. WHAT IS YOUR RELATIONSHIP WITH PIRATAS DO PAU, AND HOW DID YOU COME TO WORK WITH THEM? My relationship with Piratas do Pau goes back to when the company started over 6 years ago. My partner Ab Oostewaal founded it and we have since shared ideas and worked together. 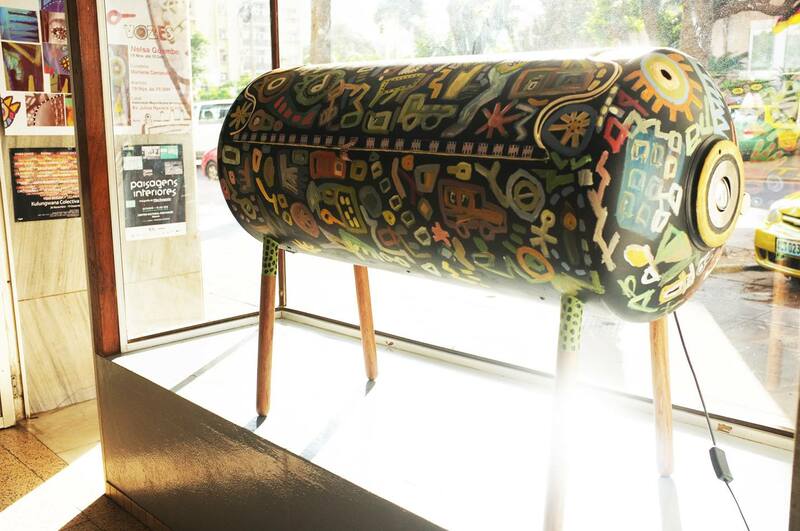 We started working intensively together at the end of 2014, the business was growing, and for me, it was the perfect opportunity to work with a young team designing and producing unique furniture with reclaimed materials and incorporating my art in it. WHAT INSPIRED YOU TO TURN OLD WATER HEATERS INTO PRODUCTS LIKE WINE RACKS? WHERE DO YOU GET THE HEATERS FROM, AND WHAT IS THE PROCESS OF TURNING THEM INTO THE FINISHED PRODUCT? At Piratas do Pau we work a lot with water heaters, we make different products from bookshelves to tables and lamps, and so forth. But what inspired me to create products like the wine racks was my love for functional art as well as wine..:). The idea of recycling metal and creating a long-lasting object that can be used year after year made me want to dig in and see how to recycle metal. The old water heaters we get here in Maputo, we buy them from young boys who go around the city collecting metal. They know we are looking for old water heaters so they bring them to our apartment. As with many recycling products, it is a process to get to the finished product. We have a welder, painter, and carpenter who take on the production cycle. EACH WINE RACK IS UNIQUE, DO YOU DESIGN THE WINE RACKS, AS WELL AS ILLUSTRATE THEM? AND WHAT IS THE INSPIRATION BEHIND YOUR ILLUSTRATIONS, DO THEY HAVE MESSAGES OR MEANINGS? The wine racks are co-designed by Ab and myself and after I illustrate them. The inspiration comes from the daily life of Mozambican women, the illustrations are a portrayal of their, strength, and challenges as women in a society that uplifts men, and fails to adequately protect and provide for women. I see what I do more as a homage and appreciation to women. So this is why I generally paint women in the center (the door), to show their presence. LOOKING TO YOUR CITY AND COUNTRY, WHAT ARE THE PROBLEMS WITH REGARDS TO DISCARDED WASTE AND ITS IMPACT ON THE ENVIRONMENT? AND, IS THERE MUCH HAPPENING IN THE WAY OF PEOPLE AND COMMUNITIES RECYCLING? Mozambique does not have an efficient system for waste management, of any kind. So you see waste everywhere. Although people use and reuse everything there is not much-organized recycling and upcycling in Mozambique yet. There are a few initiatives working on it but we definitely need more and I hope things will change in the coming years. WHAT KIND OF IMPACT DO YOU THINK THAT DESIGNERS AND ARTISTS LIKE YOURSELF, AND THE PRODUCTS YOU CREATE, HAVE ON CREATING AWARENESS FOR RECYCLING MORE AND LOOKING AFTER THE ENVIRONMENT WE LIVE IN? For a country like Mozambique where there is very little production (everything is mostly imported from South Africa and China), it gives a certain pride to the country in the sense that we are able to supply the market with locally produced goods that are high quality and also create employment opportunities for young people (we currently work with 15 people). It definitely opens eyes to more Mozambicans and we see the growing number of people starting to appreciate our work especially the recycled line. CAN YOU TELL US ABOUT SOME OF THE CHALLENGES YOU FACE AS AN ARTIST AND DESIGNER? With recycled material, it takes longer to make the final product, and people assume that it should be cheap. It can’t be cheap, it takes a lot of effort into making it and we focus a lot on quality, and it takes a lot of time to get the quality we want, plus is all made by hand. AS SOMEONE WHO HAS FOLLOWED HER DREAM AND IS TURNING HER CREATIVITY INTO A CAREER WHAT PIECE OF ADVICE WOULD YOU GIVE TO A YOUNG PERSON LOOKING TO START A CAREER IN ART AND PRODUCT DESIGN? Make the right partnerships, be patient, try to find like-minded people and work work work work. 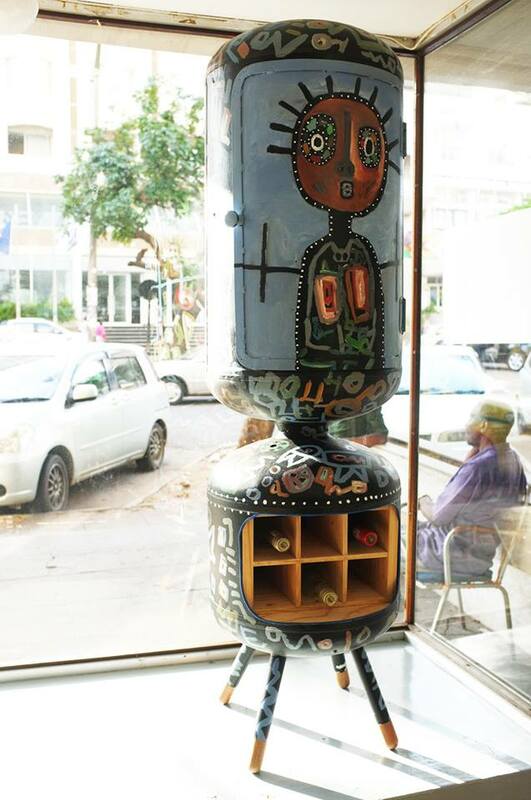 Nelsa is also the co-founder of a small gallery called DEAL – Design Entertainment, Art & Literature – a creative space that promotes Mozambican art. To find out more about Nelsa visit her website.